Sometimes 2nd place just isn't good enough for some people. And that would include Nicki Minaj. 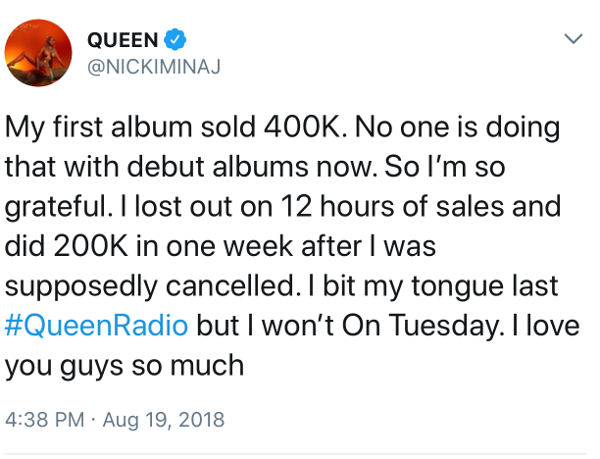 The first week sales are in for Nicki's fourth studio album QUEEN and she's not very happy about it. 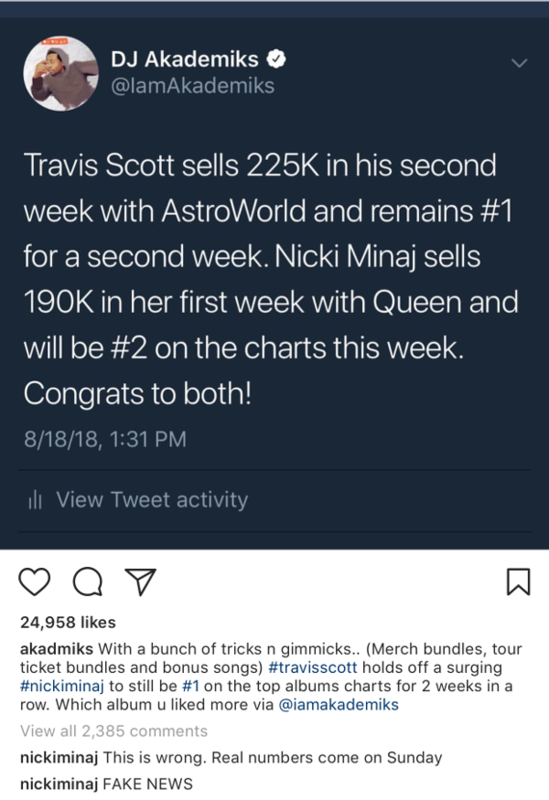 She came in 2nd place to Travis Scott's Astroworld (which was in its 2nd week) on the Billboard 200 chart. According to the numbers, Astroworld sold 205,000 units for its 2nd week and QUEEN sold 185,000 units for its first week, making it the #2 album in the world. Billboard 200: #2(new) @NICKIMINAJ, Queen 185,000 (78,000 in pure sales). "Queen" is Nicki Minaj's fourth consecutive top 2 album on the Billboard 200 (extending her record among female rappers). With the way the music industry has changed as far as album sales go, the "Chun-Li" rapper actually did pretty good for her first week sales. Yes, it wasn't first place, however, the numbers weren't totally bad. 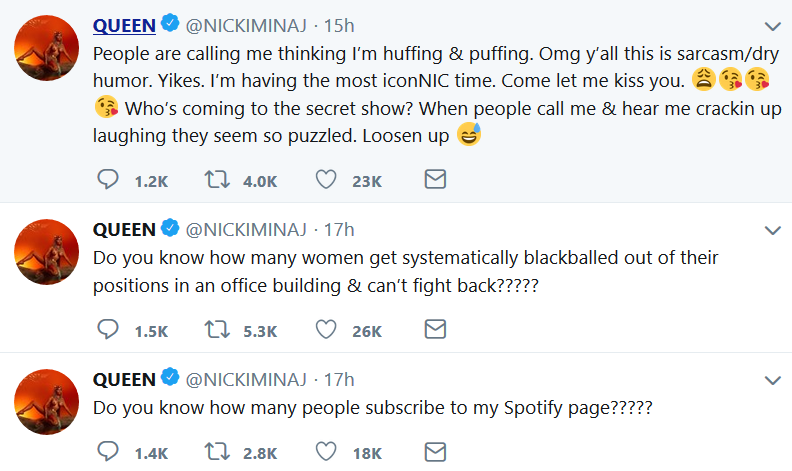 Well, the final numbers weren't good enough for the Head Barb, so she took to Twitter to try and explain to the masses why her album came in 2nd place. Of course, she had nothing to do with it and it's everyone else's fault. 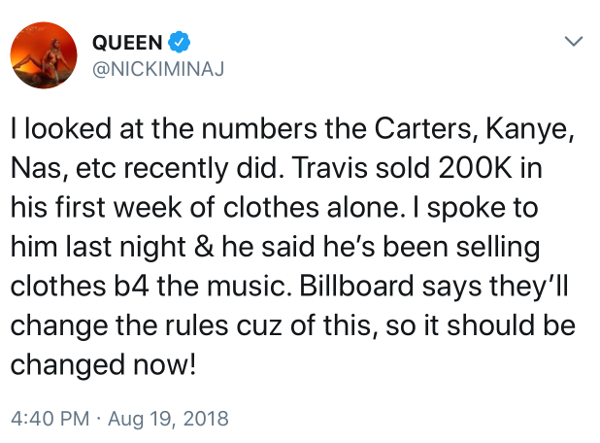 First, she blamed Travis for having his tour merch sales be counted as album sales, despite the fact he wasn't even throwing in the album to give to people who bought tour merch. Nicki, though, did throw in her album for free for fans who bought her new Queen merch. She believes she did it the right way, and that's the only way merch sales should count toward album sales. She said she spoke to Travis and he KNOWS he doesn't have the No. 1 album this week LOL! Ok, girl. 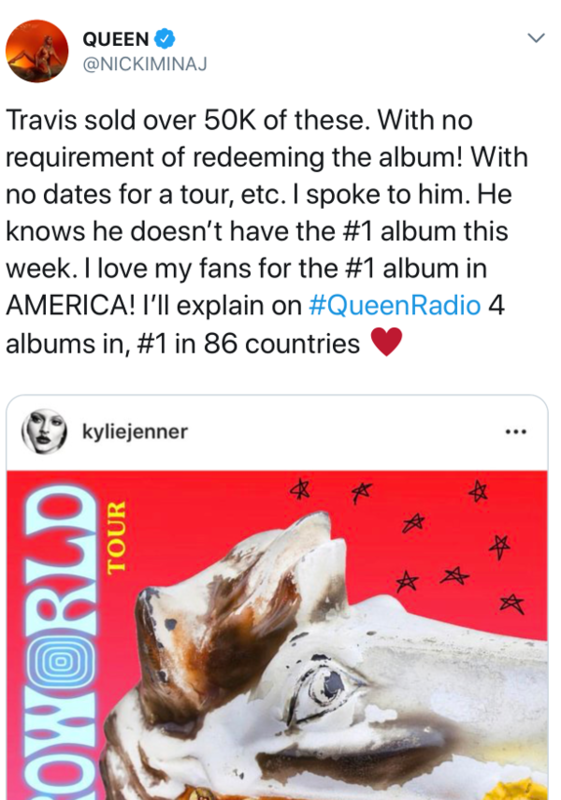 Then, she came at Travis' baby's mother Kylie Jenner for tweeting out about Travis' album. 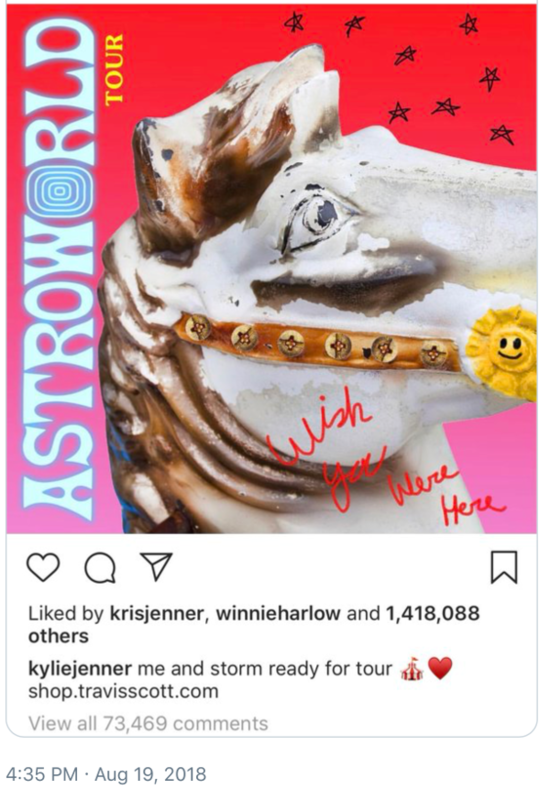 Nicki claims it was unfair that Travis had Kylie engage her followers to go out and get tour passes and merch (and possibly meet herself and their daughter Stormi) since she has a massive following online. All of that reportedly counted toward album sales. Get ready. Nicki said she's not biting her tongue for her Queen Radio episode that's going down tomorrow. 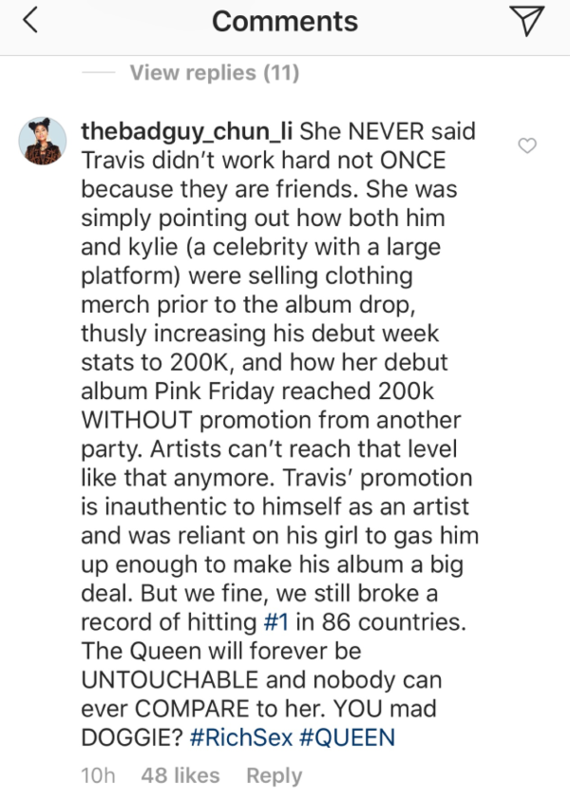 Before the official numbers came in, DJ Akademiks posted an early prediction about Travis and Nicki's album sales. The "Anaconda" rapper didn't waste any time hopping in the comments to call his tweet "fake news" and that the real numbers didn't come out until Sunday. Well, what's worse is the fact that she called this "fake news" and ended up selling LESS units than predicted. Nicki called me reporting her album selling 190k fake news only to find out she sold lower. I’m logging off. Goodnight. 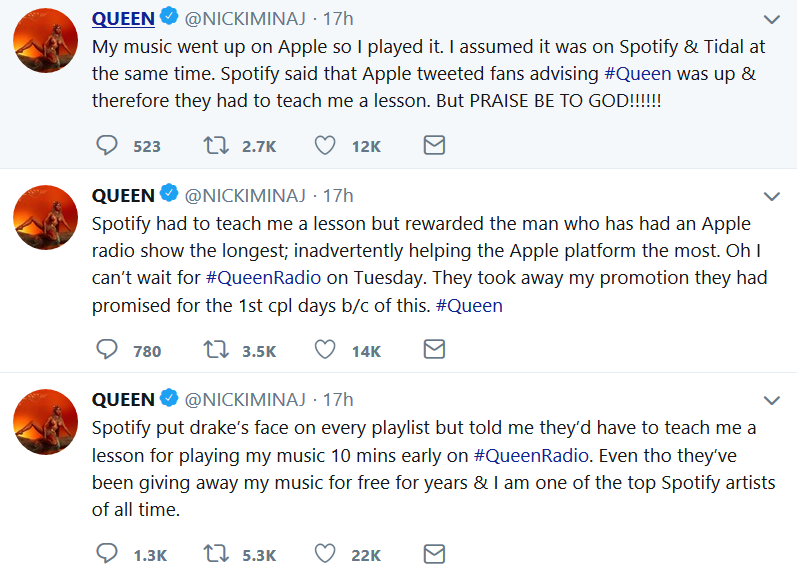 Nicki pulling a Kobe and throwing Drake under the bus basically saying we did the same sh*t but I’m the only one who got penalized. . I’m waiting on the Spotify = Fake Streams tweet. 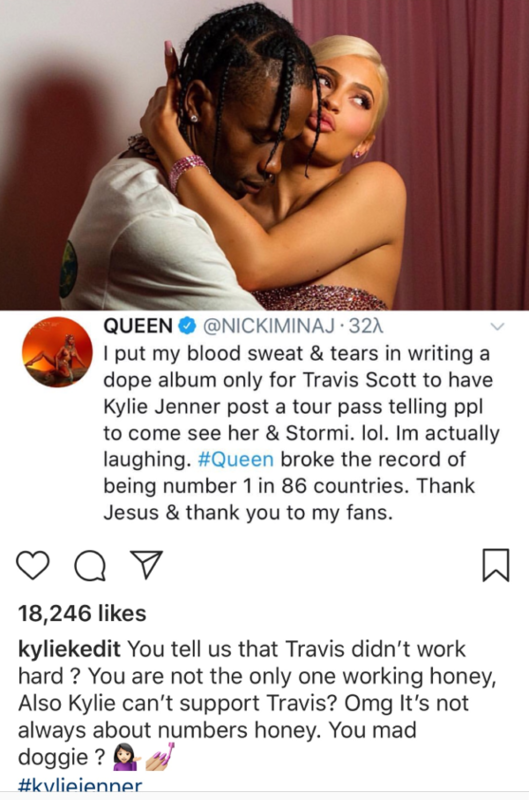 I can’t believe Nicki Minaj tried to attribute her L to Travis Scott to a baby and Kylie in this weeks sales. Did we forget when Kylie and the whole kardashian family supported Tyga album and it went TRIPLE COPPER. Accept #2 sis... ain’t no baby prevent ya album from being #1. @travisscott out here getting buckets!